Rico Abreu, driver of the No. 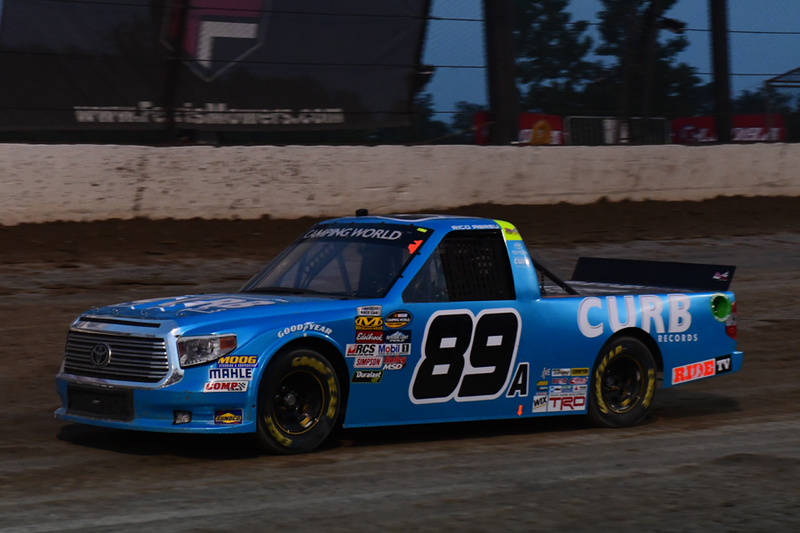 89 Curb Records Toyota Tundra made his NASCAR Camping World Truck Series return in Wednesday night’s Eldora Dirt Derby at Eldora Speedway in Rossburg, OH. Making his second start at the historic half-mile clay oval, the two-time Chili Bowl Nationals and USAC Midget Champion, started the 150-lap event from the 15th position, finishing 14th in Stage 1, and eighth in Stage 2. Unfortunately, a flat right rear tire late in the 150-lap event would end Abreu’s night early, relegating the ThorSport Racing driver to a 26th-place finish behind teammate, and race winner, Matt Crafton. The NASCAR Camping World Truck Series (NCWTS) had two practice sessions on Tuesday evening in preparation for Wednesday night’s Eldora Dirt Derby at Eldora Speedway. Rico Abreu was fifth, and 14th, respectively, in each session. The No. 89 Curb Records Toyota Tundra was 10th in single truck qualifying on Wednesday afternoon. Abreu lined-up second in Qualifying Race No. 5, and finished third, earning a 15th-place starting position for the main event. Starting a track-best 15th, Abreu ran as high as third in the 150-lap event, finishing 14th in Stage 1, and eighth in Stage 2. Unfortunately, a flat right rear tire late in the 150-lap event would relegate the Curb Records driver to a 26th-place finish in his second start at Eldora Speedway in the NCWTS. In two NCWTS starts at Eldora Speedway, Abreu has one top-five finish (2016). In 26 career NCWTS starts, Abreu has led one lap en route to two top-five and five top-10 finishes.